This is an ad hoc summation of Paul Feyerabend’s book Farewell to Reason, which presents a vigorous challenge to scientific nationalism. Feyerabend was Professor of Philosophy at the University of California at Berkeley and Professor of the Philosophy of Science at the Federal Institute of Technology at Zurich. He died in 1994. Paul Feyerabend may have been the last major philosopher of the twentieth century, although his critics would rather he had never taken up his pen. Feyerabend (whose name is pronounced ‘fire-a-bend’) is that rarest of things, a relativist with claws. While other relativists have found themselves retreated to an untenable position akin to solipsism (the belief that the only thing one can know with any certainty is one’s own perceptions), Feyerabend runs roughshod over the landscape of philosophy with the sure footed confidence of someone not only blessed with great intellect, but an exceptional grasp of history and a grand compassion that is infectiously democratic. Farewell to Reason is a collection of disparate essays which deal with cultural diversity and cultural change. Their goal is to demonstrate that diversity is beneficial while uniformity reduces both our available resources and the joy of living. Although it succeeds in this goal, it will not convert Feyerabend’s opponents (whose philosophical position, frankly, may be so entrenched as to perhaps be intractable) and his rigorously presented arguments are not for the intellectually timid, nor for the philosophical amateur. This material is hard to read – but all the more rewarding because of it. (In order to get the most from Feyerabend, an awareness of the philosophies of Wittgenstien and Kuhn is an inessential but useful starting point. Anyone approaching Feyerabend from a position of total philosophical ignorance is likely to be completely out of their depth, or at the very least, unlikely to fully comprehend Feyerabend’s concepts). Feyerabend contends that there exist powerful traditions which oppose diversity. The proponents of these points of view concede that people may arrange their lives in a variety of fashions but they insist that there must be limits to variety, and further claim that these limits are constituted either by moral laws which regulate human action, or by physical laws which define our position in nature. In particular, Feyerabend criticises two ideas which have historically been used to justify and make respectable the expansion of Western forms of life (or the ‘brave new monotony’, as one essay terms it) – namely the idea of Reason and the idea of Objectivity. When someone says that a procedure or point of view is objective (or ‘objectively true’, which is synonymous) they are asserting that it is valid irrespective of human expectations, ideas, attitudes and wishes. It is an underlying claim which many modern scientists and intellectuals assert about their work. This issue is explored in more depth than I can possibly reproduce here, with historical examples spanning from the ancient Greeks through Galileo to more modern examples such as Popper. (Fans of Popper beware: Feyerabend worked with Popper at one point in his life and appears to have developed a pathological hatred of the father of what is termed ‘naïve falsificationism’). Hardnosed empiricists regard it as irrational to retain view plainly in conflict with experiment while hardnosed theoreticians smile at the irrationality of those who revise basic principles at every flicker of the evidence. The assumption that there exist universally valid and binding standards of knowledge and action is a special case of a belief whose influence extends far beyond the domain of intellectual debate. This belief… may be formulated by saying that there exists a right way of living and that the world must be made to accept it. We may surmise that the idea is a leftover from times when important matters were run from a single centre, a king or a jealous god, supporting and giving authority to a single world view. And we may further surmise that Reason and Rationality are powers of a similar kind and are surrounded by the same aura as were gods, kings, tyrants and their merciless laws. The content has evaporated; the aura remains and makes the powers survive. Wilson’s work, however, and especially those with the patience for highly academic material, would gain much from considering Feyerabend. Rather than discuss all of the essays in Farewell to Reason, I shall focus my attention primarily on the first and the final chapter. This is not to say the other material is not fascinating (or, in the case of ‘Aristotle’s Theory of Mathematics’ completely beyond my comprehension! ), but these two chapters have the most general remit, and therefore are perhaps easier to summarize. The first chapter discusses a particular attempt to make sense of the phenomena of cultural variety, namely relativism. In this essay, Feyerabend begins by presenting a particular thesis (which I will include here), then gradually strengthens the idea presented through a series of arguments. I cannot summarise this adequately, so one must accept that what I present here gives you some idea of how this chapter proceeds but does not give you the necessary information to fully comprehend (or meaningfully oppose) this viewpoint. For this, you must read Feyerabend’s work yourself. R1: individuals, groups, entire civilizations may profit from studying alien cultures, institutions, ideas, no matter how strong the traditions that support their own views (no matter how strong the arguments that support these views). For example, Roman Catholics may profit from studying Buddhism, physicians may profit from a study of the Nei Ching or from an encounter with African witch doctors, psychologists may profit from a study of the ways in which novelists and actors build a character, scientists in general may profit from a study of unscientific methods and points of view and Western civilization as a whole can learn a lot from the beliefs, habits, institutions of ‘primitive’ people. (Note that this does not make a recommendation, nor suggest a requirement. It merely suggests that such a study may have effects which could be regarded as beneficial). The thesis is rejected, which happens when a tightly knit world view is regarded as the only measure of truth and excellence, as happens with certain religious, political or scientific beliefs. The thesis is rejected, but only in certain areas, as occurs in pluralistic cultures with separate components (religion, politics, art, science etc.) that are each guided by a well defined and exclusive paradigm. An exchange of ideas and attitudes between different domains (cultures) is encouraged, but is subjected to the laws that rule the domain (culture) entered. An acceptance that even our most basic assumptions, our most solid beliefs, and our most conclusive arguments can be changed, improved or defused, or shown to be irrelevant by a comparison with what at first looks like undiluted madness. He then discusses in great length the relationship between modern science and this thesis, in a section that defies easy summation. R2: societies dedicated to freedom and democracy should be structured in a way that gives all traditions equal opportunities, i.e. equal access to federal funds, educational institutions, basic decisions. Science is to be treated as one tradition among many, not as a standard for judging what is and what is not, what can and what cannot be accepted. (Feyerabend is quick to point out that he does not favour the export of ‘freedom’ into regions that are doing well without it and whose inhabitants show no desire to change their ways. Rather, R2 is restricted to societies based upon ‘freedom and democracy’ in order to avoid facile generalisations). R3: Democratic societies should give all traditions equal rights and not only equal opportunities. R10: for every statement (theory, point of view) that is believed to be true with good reasons there may exist arguments showing that either its opposite, or a weaker alternative, is true. 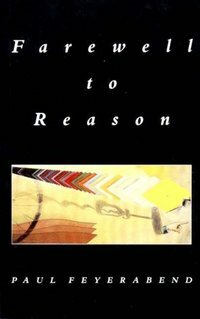 R11: For every statement, theory, point of view believed (to be true) with good reasons there exist arguments showing a conflicting alternative to be at least as good, or even better. Why should it not be possible to say conflicting things about ‘the same situation’ and yet be right? A picture that can be seen in two different ways (Wittgenstein’s duck-rabbit is an example) can be described in two different ways – and both parties will be right. It is a matter of research and not of philosophical fiat to decide whether the world we inhabit resembles a duck-rabbit picture. Nor am I asserting that we can do without the sciences. We cannot. Having participated in, or permitted, the construction of an environment in which scientific laws come to the fore, both materially, in technological products, and spiritually, in the ideas that are allowed to guide major decisions, we, scientists as well as the common citizens of Western civilization, are subjected to their rule. But social conditions change and science changes with them. This essay opens Farewell to Reason with a resounding clatter of cymbals, presenting and arguing for an understanding of relativism with a thoroughness and philosophical precision which is admirable. My précis here captures only a fragment of the piece, and even then only the tone is conveyed, not the underlying arguments. For this, one must read ‘Notes on Relativism’ oneself. One of the most striking aspects of this piece is the way it places science and religion on equal footing by considering both to be ‘traditions’. This approach had not occurred to me before, but provides a useful tool for examining belief systems from markedly different backgrounds. Viewed from Feyerabend’s vantage point, the last few hundred years of the history of science seem rather like Orwell’s Animal Farm: the forces of Reason manage to unseat the tyrannical despotism of religious traditions, only to take upon the aggressive fundamentalism of that which they opposed (but from a different set of prior beliefs – replacing theism with positivism i.e. the idea that the only authentic knowledge is scientific knowledge), and eventually emerging themselves as fanatical dictators, imposing onto others what can and cannot be believed. One might be inclined to suggest the problem was not with the religion or science that provided the motivation, but in the fascism that resulted. As someone already sympathetic to relativism, the most surprising part of this chapter for me was how it made me re-evaluate democracy. For the first time in many years, I began to consider how democratic values might be worth rescuing, instead of being trapped in a place where the only political philosophy that seemed appealing was ‘enlightened anarchy’ (a state achievable only by luck). It is a call to arms for everyone open to new ideas, diversity of belief, and variety in approach, to participate in the development of our own societies. The final chapter appears to have been written to clarify points Feyerabend raised in his book Against Method, and as such has a strangely uneven quality. However, it makes a good closing statement for this book, as well as a potential introduction to Feyerabend’s earlier work. A theory of science that devises standards and structural elements of all scientific activities and authorizes them by reference to some rationality-theory may impress outsiders – but it is much too crude an instrument for the people on the spot, that is, for scientists facing some concrete research problem. The most we can do for them from afar is to enumerate rules of thumb, give historical examples, present case studies containing diverging procedures, demonstrate the inherent complexity of research and so prepare them for the morass they are about to enter. I assert that there exist no ‘objective’ reasons for preferring science and Western rationalism to other traditions. Indeed it is difficult to imagine what such reasons might be. Are they reasons that would convince a person, or the members of a culture, no matter what their customs, their beliefs or their social situation? Then what we know about cultures shows us that there are no ‘objective’ reasons in that sense. Are they reasons which convince a person who has been properly prepared? Then all cultures have ‘objective’ reasons in their favour. Are they reasons which do not depend on ‘subjective’ elements such as commitment or personal preference? Then ‘objective’ reasons simply do not exist (the choice of objectivity as a measure is itself a personal and/or group choice – or else people simply accept it without much thought). [Some intellectuals] distinguish between basic science and its application: if any destroying was done, then this was the work of the appliers, not of the good and innocent theoreticians. But the theoreticians are not that innocent. They are recommending analysis over and above understanding, and this even in domains dealing with human beings; they extol the ‘rationality’ and ‘objectivity’ of science without realising that a procedure whose main aim is to get rid of all human elements is bound to lead to inhuman actions. Or they distinguish between the good which science can do ‘in principle’ and the bad things it actually does. That can hardly give us comfort. All religions are good ‘in principle’ – but unfortunately this abstract Good has only rarely prevented their practitioners from behaving like bastards. The inevitable consequences of this statement are hopefully clear, and I will leave the political ramifications in respect of foreign policy as mere implications. This is a general feature of all ideological debates: arguments in favour of a certain world view depend on assumptions which are accepted in some cultures, rejected in others, but which because of the ignorance of their defenders are thought to have universal validity. (A) the way in which scientific problems are attacked and solved depends on the circumstances in which they arise, the (formal, experimental, ideological) means available at the time and the wishes of those dealing with them. There are no lasting boundary conditions of scientific research. (B) the way in which problems of society and the interactions of cultures are attacked and solved also depends on the circumstances in which they arise, the means available at the time and the wishes of those dealing with them. There are no lasting boundary conditions of human action. (C) that science and humanity must conform to conditions that can be determined independently of personal wishes and cultural circumstances. (D) that it is possible to solve problems from afar, without participating in the activities of the people concerned. (Opponents of the IMF, and of cultural imperialism of any kinds, will especially appreciate this point). Historical traditions cannot be understood from afar. Their assumptions, their possibilities, the (often unconscious) wishes of their bearers can be found only by immersion, i.e. one must live the life one wants to change. Neither (C) nor (D) apply to historical traditions… my main objections against intellectual solutions of social problems is that they start from a narrow cultural background, ascribe universal validity to it and use power to impose it on others. Is it surprising that I want to have nothing to do with such ratiofascistic dreams? Helping people does not mean kicking them around until they end up in someone else’s paradise, helping people means trying to introduce change as a friend, as a person, that is, who can identify with their wisdom as well as with their follies and who is sufficiently mature to let the latter prevail: an abstract discussion of the lives of people I do not know and with whose situation I am not familiar is not only a waste of time, it is also inhumane and impertinent. As far as I am concerned there exists no difference whatsoever between the henchmen of Auschwitz and these ‘benefactors of mankind’ – life is misused for special purposes in both cases. The problem is the growing disregard for spiritual values and their replacement by a crude but ‘scientific’ materialism, occasionally even called humanism: man (i.e. humans as trained by their experts) can solve all problems – they do not need any trust in and any assistance from other agencies. How can I take a person seriously who bemoans distant crimes but praises the criminals in his own neighbourhood? And how can I decide a case from afar seeing that reality is richer than even the most wonderful imagination. It is apparent, I suspect, that Feyerabend’s work is both polemic and completely against conventional assumptions many intellectuals take for granted. Indeed, the worth of his work lies precisely in his willingness to take such a hard stance against pervasive ideologies that are seldom identified and rarely opposed openly. If there is a flaw in Feyerabend’s approach it is not with his philosophy, per se, but in its application. Is it possible for the transformation of science and society to proceed at a ‘grass roots’ level, from the everyday citizen? It is possible, but doubtful. We have handed over tremendous political and academic influence to intellectuals (who, for instance, can affect political decisions without themselves being elected as representatives), and they will not give up their power lightly. Opposing this state of affairs by attacking the philosophies which are used to prop up the status quo will likely fail because people with strong belief systems are rarely convinced by contrary argument. What perhaps is needed are people to come to the imaginary negotiating tables with the intent of building bridges. This is what I attempt in my life. It is a thankless task – opponents of religion insist that those with religious belief systems cannot be reasoned with, while opponents of science insist that those with materialist belief systems cannot be reasoned with. I dispute both propositions, although I cannot deny it seems harder to reason with the latter (whose faith is often more absolute) than the former (for whom doubt is a more common experience). Indeed, in my own philosophical investigations, I have thus far been attacked only by the latter, and never by the former, but I do not claim from this trivial sample that blame is attributable to one party and not the other. Feyerabend draws a line in the sand, and stockpiles enough philosophical ammunition to arm potential revolutionaries willing to tackle the difficult problem of engaging an ‘enemy’ who does not appear to recognise their own culpability, and who seem determined to enforce their solutions on other people against their will. I would prefer to find ways to avoid the conflict entirely, but to do so may require inestimable patience in the face of people with intractably absolute belief systems. I suspect I lack Feyerabend’s pugnacious confidence, but I am certainly grateful to have access to his body of work. I welcome discussion, but please remember this is a summation of a book: if you wish to fully understand, usefully critique or meaningfully oppose Feyerabend’s views, you should read the book first and not assume my synopsis is anything other than a brief introduction to his work. Or to put it another way: Don’t shoot the messenger! My best wishes to you all! Feyerabend seems like quite an intellectual titan in his own right, obviously, but one who has his guns pointed in the right direction. Actually, scratch that--aren't so many of our arguments doomed from the start because of the language we choose to present them with? Feyerabend clearly isn't pointing "guns" at anyone, and in fact seems rather against all the kinds of people who are pointing guns (metaphorically but also rather physically, I guess). I think he's got it dead nuts on regarding that it isn't religion or science per se that is the problem once absolutist thinking becomes entrenched, but the fascist thinking that powers it. I also appreciate his structured view of relativism, given that relativism can prove just as deleterious as other ideologies if not held in check, as well as his broader view of science. Perhaps it's the place I've come to in my own life, but Feyerabend's points don't actually seem all that challenging to me, more of a very well considered elaboration on that nagging sense that comes whenever you feel like you've gotten a pretty good handle on things, or when you feel like you've "got it". My mind's a bit too foggy right now to engage on any more advanced level, so I'll leave it at that. Thank you for taking so much time in presenting Feyerabend's obviously rather challenging and complex arguments. Certainly looks like its worth a read. However, "connecting the dots" i.e. synchronising viewpoints and "vocabulary" (in the sense introduced by Wittgenstein) in order to achieve a specific political or social goal turns out to be extremely difficult. One reason is that these people live in radically different economical as well as cultural and language contexts. I think a fruitful approach is to keep an eye on "extremist" scientific materialism as well as on the analysis of language but at the same time try to enrich your "vocabulary" beyond what people like Feyerabend may be able to offer. One proposal would be H.Arendt's "human condition" which in my view achieves a critique of "scientific materialism" (among other facets of modernity) very similar to the one cited above but from a radically different angle, conducting an investigation of human life from the polis of ancient Greece to Auschwitz. In other words... there is no 'right way' and all humans are corrupted towards a bias by the very nature of being human. For some reason, Feyerabend's conclusions make the most sense to me in the context of the relationship between parents and their children. The two primary goals of a parent is to protect and prepare, which can easily contradict, and the polarized roles of the parent are the 'tyrant' and the 'benefactor', which both have positive and negative implications for protecting a child and preparing a child. Children of a tyrant are often too rigid in their thinking and unable to self-direct, while children of a benefactor are often spoiled and incapable of self-discipline. Watching the debate over MySpace and the appropriateness of videogames for children kind of crystalizes the conflict between overprotecting and spoiling. Translucy: I've added Hannah Arendt's "Human Condition" to my ever-growing reading list... I don't know when I'll get to it, but it sounds right up my street! I am very curious as to your background; if you get a chance, I'd love to be able to put your comments into some kind of wider context. Eric: "all humans are corrupted towards a bias by the very nature of being human" - great statement! :) Thanks for the primate links! I'd write more, but I'm feeling a touch unwell today; I seem to have picked up a throat infection while caving in Wales. thanx for your interest. Do you read german? Do you know somebody who does? If yes, I could point you to some literature that conveys the context much better than any improvised ramblings on a blog. Alas, my languages are English, French and Japanese; I'm not sure who I know that speaks German. there may be another way to provide context on what Feyerabend, Wittgenstein, Arendt and all the rest have to do with the republique de lettres, creative anarchy and game design. I would ask you to read Choderlos' "Les liaisons dangereuses" and Austen's "Pride and Prejudice" applying your full set of analytical skills from philosophy and narrative game design. I would be extremely curious to learn what you find out. Watching "Valmont" and the BBC series will probably help as well. Don't ask me why Mr. Firth stars in both productions, I guess you have a lot more to say about the design of visual character-related traits. One note though: "Serious scholars" mostly have viciously derided the investigation of supposedly "romantic novels" from previous centuries. It seems sometimes hard to tell whether such a proposal is ironic or not. This one is not. You may come across a book by Lauren Henderson in which she tries to playfully investigate Jane Austens novels. I would agree that some of what she writes is either ironic or over the top. But her attempt to transfer Austen's narrative elements into real world game play is worth to be appreciated. Well, the paradox of relativism is that a self-reflexive application does seem to lead to solipsism. Gosh, i haven't been here in a while and see what I miss. I would love to contribute to this topic too but I haven't yet read the book (it has been on my reading list since I stumbled on the philosophy of science). I read Kuhn's The Structure of Scientific Revolutions but that only made me want to read Feyerabend all the more. However, other books on my reading list have introduced perspectives that muddy the waters; specifically Conner's A People's History of Science and Jeff Schmidt's 'Disciplined Minds'. Have you heard of or read either of those books? If so do they attack or support any assumptions (on history) that Feyerabend makes before setting up his arguments? Gyan: relativism need not lead to solipsism; one need not resort to absolutes to avoid falling into the philosophical oubliettes. Feyerabend deals with this issue in passing in this book - give it a try, if you're interested in the subject! Best wishes to everyone! Sorry for anyone whose comments have been lost in the shuffle. I have faith that anything of consequence will re-emerge of its own volition. I had a look at the book today. Since I didn't have time to read the whole thing, I went by the index and looked up references to solipsism (none), sense experience (a few), relativism, epistemic (one) and really didn't find a treatment of this issue (relativism !-> solipsism). Can you point to the specific essay? Or better, paraphrase his argument on this matter? Gyan: *Sigh* Book indexes rarely seem to be up to scratch, do they... I doubt I'll find the note in the book, since it comes up only in passing, and searching would take a long time - Feyerabend's text is dense, and his footnotes are monumental! However, I can provide my view on this issue in brief: Solipsism is a philosophical oubliette which can only be escaped by the individual *choosing* to believe in the existence of other people et al. Once this step is taken, it is possible to employ relativism because you have other people and therefore have cultures and histories (etc.) which have their own positions which individuals can position their own beliefs in relation to. Or, to put it another way, while relativism allows for values to vary from culture to culture, or individual to individual, this variation in values and beliefs does not ipso facto lead to dismissal of the idea that other people exist, and therefore cannot (by itself) lead to solipsism. And with regard to the other flavour of solipsism (external world scepticism) the same arguments apply: relative beliefs and values may permit an individual to *choose* solipsism, but the same is true in any frame of belief. The step into solipsism is always taken by the individual when they abandon either the postulate of an external world or the postulates of other people. This step can be taken from any initial position - even stepping off from objectivism! Chris: "Once this step is taken, it is possible to employ relativism because you have other people and therefore have cultures and histories (etc.) which have their own positions which individuals can position their own beliefs in relation to." The problem is that your perception of these cultures and histories, is after all, completely and only --> your <-- perception of them, ergo solipsism. You may choose to believe that your perceptions share some commonality, but that's your only resort. Gyan: we appear to be using the term 'solisism' slightly differently. What might be best would be if I discussed solipsism at a future point, and we can return to this then. As a ps, I'd like to recommend a book to add to your (from the sound of it) unending reading list. It's called 'An Anthropological Critique of Development' edited by Mark Hobart - very strongly influenced by Feyerabend, all pieces by development workers dealing in the mismatch between local knowledge and the assumed universality of scientific objectivity, and the disasters that resulted. Applied Feyerabend, if you like. The essay on Potatoes and Knowledge is one that sticks out in the memory. Another pointed out the systematic deception at every level that was an absolutely necessary part of development work. It makes for uncomfortable reading. The conclusion seems to be that the most humane thing is to let others sort out their own problems. Encumbering others with help doesn't seem to do much good and probably does a lot of harm. Of course, this does not contradict fighting the IMF, World Bank and WTO, but this is a purely negative act - stopping them from intervening and taking away the independence of poor nations. ps. great blog, very thought-provoking. Thanks for your comment Theo! I've added the book you recommend to my reading list - it may take a while to get there, but it sounds like valuable reading. Regarding the problems with relativism, these are issues I am actively involved in exploring myself. Having recently finished a 'blog campaign' on the subject of metaphysics, I am working towards a future campaign on the subject of 'Relativistic Ethics'. I plan to demonstrate that having a relativistic viewpoint need not be a barrier to holding a coherent ethical standpoint. However, I have much work to do before I'm ready for this undertaking! Glad to know that you have enjoyed my blog, and hope to 'see you around' in the future. There is a tension between Feyerabend's ideas and George Orwell's statements about tyranny. Orwell says in a number of places that democracy depends on our ability to check the assertions of the powerful against an exterior and independent reality. We must assume that objectivity is possible, according to Orwell. The dodgy dossier and claims about Iraqi WMDs spring to mind. As does the statement of a Republican spokesman, confronted with the lies and deceptions prior to the Iraq war, who replied (I paraphrase) 'There's no such thing as truth, so if we say it's so then it's so.' This is really a point about metaphysics, though it involves a question of responsibility. As far as ethics go, there is an ethical argument against ethics (a rigid ethical code can do monstrous things - up to and including the holocaust). The theologian Don Cupitt argues for a deliberately unsystematic and fragmented ethics for this sort of reason - which needn't stop it drawing on Biblical tradition, among other things - but it isn't confined by it either. Riding two horses at once? Perhaps I should adopt it as my moniker here. At the interface between politics and philosophy in our current affairs is the issue of truth - and what we absolutely must not allow is a situation whereby the state holds sway over what may be considered true. This power must always lie in the hands of individuals. More on this in the future, I'm sure. When I talk of relativistic ethics, I do not expect this can be rendered as a rigid code. Rather, I seek to look at how the game of ethics is played and perhaps provide an alternative approach. "In [_After Virtue_], I concluded both that ‘we still, in spite of the efforts of three centuries of moral philosophy and one of sociology, lack any coherent rationally defensible statement of a liberal individualist point of view’ and that ‘the Aristotlean tradition can be restated in a way that restores rationality and intelligibility to our own moral and social attitudes and commitments.’ But I also recognised that these conclusions required support from an account of what rationality is, in the light of which rival and incompatible evaluations of the arguments of _After Virtue_ could be adequately accounted for. I promised a book in which I should attempt to say what makes it rational to act in one way rather than another and what makes it rational to advance and defend one conception of practical rationality rather than another. Here it is"
I find him absolutely compelling as at intellectual historian, and very stimulating as a moral philosopher. "The problem is the growing disregard for spiritual values and their replacement by a crude but ‘scientific’ materialism, occasionally even called humanism: man (i.e. humans as trained by their experts) can solve all problems – they do not need any trust in and any assistance from other agencies". Maybe this is crude question, but what agencies did Feyerabend have in mind when he said "other agencies"?. A religious person could say "God", but did Feyerabned believe in god? If not, how would he answer my question? Any suggestions? Feyerabend was not a theist himself, and didn't obviously have any overt spiritual beliefs he shared in his writing, but unlike many modern philosophers he realised that there was more to how we live in the world than determining one solitary version of truth. It was his feeling that there were many cultural traditions - including but not limited to religions - that had a justifiable claim to validity as a guide to life (or some aspect of life). He did not believe in pre-empting any life decision on some static basis. So when he refers to "other agencies" in the sentence you quote, I believe this is expressed from the point of view of the scientific materialist/humanist he criticises: it is in such a person's voice that "other agencies" (which would indeed include God) are dismissed. Feyerabend, conversely, would leave it to the people concerned to determine which "other agencies" they might be influenced by. With ALL this talk about the infinite reading list, perhaps you could dedicate a space on your site to an extended bibliography, those read and those awaiting reading. Reading Popper was a turning point in my philisophical development, although it was more a matter of being thrilled to find the chaotic elements of my own world view properly organized, rather than arriving at a new perspective. I would also recommend Conjectures and Refutations to those having less in the way of a philosophy background (I myself am an engineer), rather than LSD (dont you love that abbreviation for a philosophy book), which is more methodologically rigorous. C&R provides a lot of context wrt other philosophers and schools of thought, which is most valuable for a person like myself, self taught (self directed) in philosophy. I have been bogged down for several years in Penrose's Road to Reality, but have taken time out periodically to digest other material. One item that stands out is Arthur Herman's 'How the Scots Invented the Modern World', which is a quick easy read on the origins of the Scottish enlightenment and it's impact on contemporary western (particularly American) culture. Thanks for this very iteresting blog! Paul: thanks for the kind words, and the suggested reading! I *still* haven't actually read any Popper directly (although I have read much about his philosophy from various sources), simply because I am hoping to find some Popper in a second hand bookstore at some point. Since one of the games I enjoy most is fishing for books I want among the shelves of bookstores, I don't want to rob myself of the pleasure of finding one I really want - but in the case of Popper, I have waited a long time and still found nothing! "my main objections against intellectual solutions of social problems is that they start from a narrow cultural background, ascribe universal validity to it and use power to impose it on others. Is it surprising that I want to have nothing to do with such ratiofascistic dreams? Helping people does not mean kicking them around until they end up in someone else’s paradise, helping people means trying to introduce change as a friend, as a person, that is, who can identify with their wisdom as well as with their follies and who is sufficiently mature to let the latter prevail"
And believe it or not, the attitude of accepting local traditions and living and working with people as friends, not imposing solutions but working together, is now a very Catholic one. Most Catholic charities are based on this principle nowadays. And the official "Social Agenda of the Catholic Church" from 1991 takes this position based on the Scriptures and on Papal Encyclica written in the last 100 years. On the other hand I can´t accept the total rejection of any objective truth. It´s true that in an argument of two disagreeing parties both could theoretically be equally right and the problem between them was only one of different forms of communication. But if you look at the problem apart from communication, only as a problem of physical reality, then there must be a yes or no, even though at the moment the yes or no cannot yet be fully determined for lack of knowledge of all the relevant facts. Let´s take "Global Warming/Climate Change" either it is catastrophic for our environment or it is not, either it is mainly caused by human economic (or agricultural) activity or it is not. Either of these two positions, if taken up politically have enormous economic consequences. If political measures are based on false premises needless suffering of possibly billions of people in the world will follow. Relativism might lead to the position that since there is no objective truth and perception is everything, there also is no objective untruth. It is therefor permissible to artificially create any kind of perception in the mind of others, if it serves your purpose. However, every society is built on trust. Trust is based on the belief that truth actually exists and can most often be determined and that those you trust in will tell you the truth as best as they can. If all trust is lost, society will self-destruct. Notsylvia: I agree that the attitude of accepting local traditions and working with the people their as friends is a very Catholic value (arguably, a very Christian or Jesus-inspired value in more general terms) - but it must also be said that the Vatican itself (as opposed to Catholic culture as a whole) has not done as great a job of upholding this value as it could. I think perhaps one of the misunderstandings in respect to Catholicism is the idea that Vatican = Catholic, and this can be a misleading perspective, since the Catholic church is far more than just its law-makers. As for the question of objective truth, one can accept objective truth but still remain sceptical of one's ability to attain to it. It is true that it would be catastrophic if "the environment was lost" - but that does not give us the capacity to accurately anticipate which actions will lead to that consequence. The danger of accepting objective truth comes when one believes one has privileged access to that truth; it was against this Tyranny of Truth that Feyerabend argued. I take a slightly harder position on truth than Feyerabend (but a slightly softer position on truth that most people! ), but I found his arguments in this book to be extremely compelling and useful. I think, perhaps, he has been wildly misunderstood by many of his critics. Thank you for this wonderful, thoughtful post on a fascinating man I just discovered over at an Electric Universe forum, (http://www.thunderbolts.info/forum/phpBB3/viewtopic.php?f=3&t=6275&start=30) and so far I have only read his Wikipedia page (which is very good). I have often felt alone in my criticism of the new tyranny of science in our enlightened world, and as you have found, the most closed minded people I meet are scientists! So much to say on this massive issue...but can you recommend any good games for a 10 yr old (my son) that don't overemphasize cruelty, murder and control? I limit his screen time- is he just way too young for serious gaming? What are your favorite games (having read just this one post on your blog) I'm off now to read more. Dig the Electric Universe guys at Thunderbolts.info REALLY fascinating cutting-edge science that embraces mythology to some extent. Totally exposes entrenched "religious" beliefs of establishment cosmologists and geologists and astronomers. D: this is one of those comments that I have difficulty establishing if it is a very clever spambot or a person who just likes posting links! :) Could you please respond to my comment to confirm you are not a robot? Thanks!